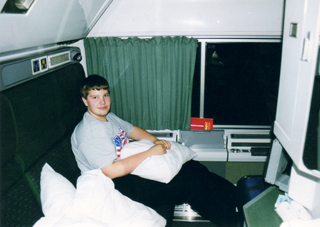 The following report details a 2002 cross country trip that can not be duplicated in 2008 since Amtrak cut direct Chicago to Philadelphia service. 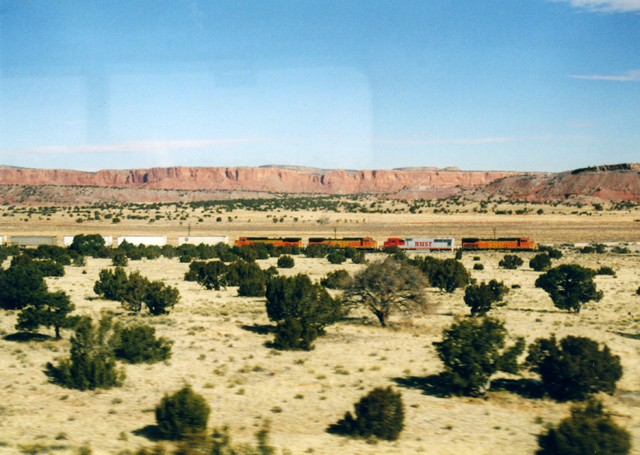 The Southwest Chief route remains one of Amtrak's best lines and the Florida trains soldier on as popular means of travel in the east. Having lost our planned round trip to San Diego due to the late arrival of the Sunset Limited into Los Angeles, we opted for a stroll to the Mexican markets on Olvera Street. Unfortunately, our luggage had to be towed along as a national security alert nixed the idea of short term bag checking. Tired from the luggage handling, we took advantage of the red cap service which delivered our luggage and us directly to our sleeper via a large golf cart. This was surely one of the wiser moves of the trip as we avoided the long walk through the tunnel under the tracks as well as the steep ramp to the platform. 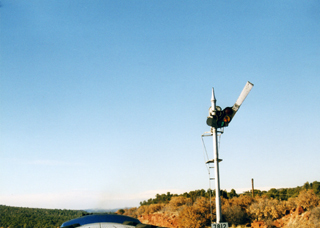 Santa Fe Railway's Super Chief was known by many as The Train of the Stars prior to Amtrak's formation and today's Southwest Chief proudly lives up to its heritage. 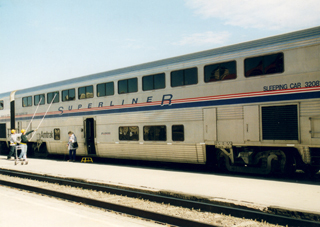 We were delighted to find our sleeper was a Superliner II car, the Illinois, which marked my tenth state named sleeper ridden. The red cap service got us trainside at 6pm, in advance of our fellow passengers. After stowing luggage in the lower level luggage rack and in our room, again # 3, there was ample time to walk the platform and record car numbers. 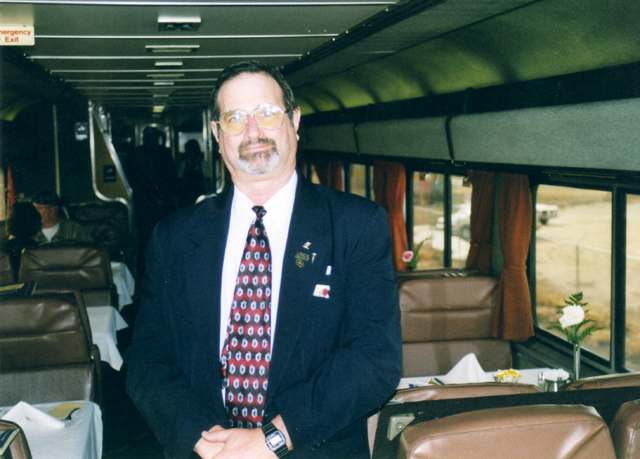 During this trek I met Bob Stone, our crew chief and undoubtedly one of Amtrak's finest employees. 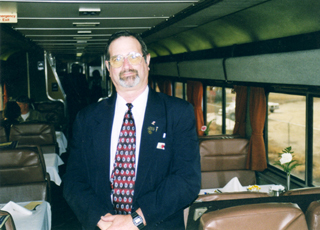 Back in 1983 my wife Christine and I had the pleasure of riding with Bob when he was the chief on the Sunset Limited between LA and New Orleans. In an amazing coincidence, I discovered Bob's excellent Southwest Chief website (www.crewten.com) via TrainWeb.com a couple weeks before our trip, exchanged e-mails, and discovered he would be working on this journey. Incredibly, our meeting 19 years earlier was one of only three times he ever worked the Sunset. As advertised, the Southwest Chief pulled away from the platform at 6:45pm though we then had to back onto the adjacent track to couple up a pair of refrigerated express cars and 15 roadrailers behind our half dozen standard express cars. Before this manuever commenced, Bob Stone had welcomed guests on board and explained the procedure rather than leaving novices to speculate. Meanwhile, our car attendant Carol, another veteran of many years with Amtrak, followed with information pertinent to guests in the Illinois. By 7:05pm we were truly underway; indeed this coupling procedure is run like a well oiled machine. As we passed the lighted Amtrak shops, we soared into the LA skies like a majestic jetliner taking flight as we negotiated the new Redondo Flyover. The flyover gently carried our streamliner aloft, above other rail lines, and banked us to the east like a plane on takeoff. Thinking back to the days when I enjoyed flying aboard Eastern Air Lines, I could only hope that Amtrak does not ever face the same bankruptcy fate. First call to dinner was made just 40 minutes out of the City of Angels and once again our sleeper was right next to the dining car. An air of ambiance filled the diner as soft jazz played songs like "Take the A Train" in the background as if in a fine restaurant. Each table included a vase containing pink carnations. 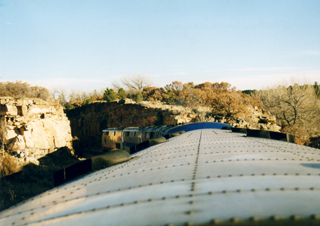 A classy menu featuring the Southwest Chief name, a southwest style border, and a picture of the Grand Canyon on a blue background enhanced the dining experience. The dinner selections included The Hawkeye (a rib eye steak), Calvados Pork Chop, Roasted Half Chicken Veronique, Baked Turbot, and Heartland Vegetarian Lasagna. A choice of six desserts included Grandma's Peach Cobbler, Margarita Cheesecake, and Chocolate Treasure. The entrees and desserts lived up to their fanciful names as each meal throughout the trip was presented in eye pleasing fashion by our chef who obviously took great pride in her work. In fact, meals aboard the Southwest Chief would prove to be the most enjoyable of any Amtrak trip I have ever taken. Following stops in Fullerton, where the San Diego line diverges, and in San Bernandino, train # 4 began the twisting assault on Cajon Pass along the San Andreas Fault. Though this trip was in darkness, I could visualize each turn having traversed the line in daylight when the Desert Wind used to run as well as having railfanned trackside a few years ago, an experience I shall never forget. After viewing the large BNSF yards at Barstow shortly after 11pm, I needed to turn in for the night as we crossed the Mojave Desert and began the process of having to set our watches forward as we crossed time zones. 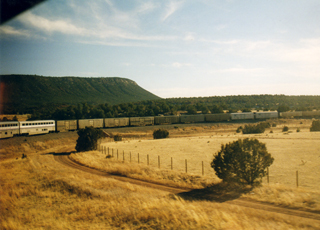 The smooth Santa Fe tradition continues today under BNSF management, providing an excellent night's sleep. Following breakfast we adjourned to the sightseer lounge to enjoy the interesting commentary of Gerald Pinto, a member of the Navajo nation, who explained native lore and pointed out scenic highlights between Gallup, NM and Albuquerque. 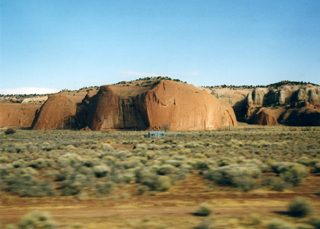 During these three hours we learned a great deal about the Native American culture and the New Mexico vistas we were enjoying from the lounge car's oversized windows. 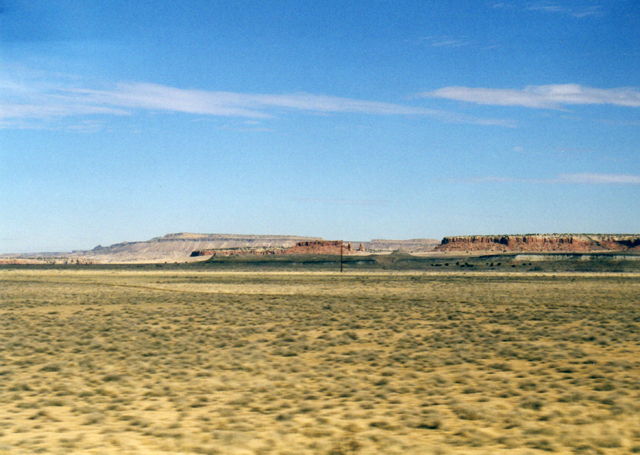 The desert scenery on the Southwest Chief is spectacular as the railway passes numerous mesas, buttes, and red sandstone formations; offers views of volcanic mountains such as snow capped 11,301 ft. Mt. Taylor; traverses regions of lava beds; and ducks through several indian reservations. The Continental Divide was crossed at 10:15am when we reached 7,200 ft. at Campbell Pass. Almost an hour later we noted the frozen Rio San Jose with patches of snow still visible in shaded spots. 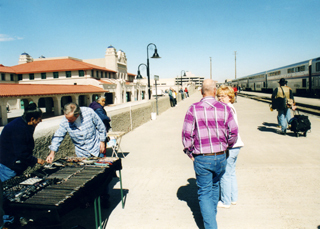 We reached Albuquerque at 12:10pm which allowed 45 minutes to walk the length of our 4 engine, 31 car train and purchase crafts from Native Americans who carry on a 100 year old tradition of selling wares on the platform. During the stopover, a crew washed the sleeping cars' windows with brushes mounted on long poles which is something seldom seen today. As we departed Albuquerque, lunch beckoned and we found that the menu featured five choices including the delicious Philly Cheesesteak sandwich that I selected. Old Santa Fe signs erected years ago to inform passengers of interesting sights remained beside the tracks at San Felipe and Santo Domingo pueblos. Departing Lamy at 2:01pm, we were escorted by Bob Stone to the crew sleeper for a unique and excellent view of a famous and exceptionally scenic stretch of our route. As good fortune had it, there was no transition crew sleeper on this trip (it was still sitting in Albuquerque where it was bad ordered the previous trip). In place of the transition car was a regular Superliner sleeper which offered a clear forward view over the top of the baggage car as both end doors on Superliner sleepers are on the upper level. Transition sleepers have only a lower level door on the forward end to allow crew access to the baggage car. Thus, only on rare occasions such as this would a forward view be possible. The forward visibility was like riding in a dome car though it required standing up. 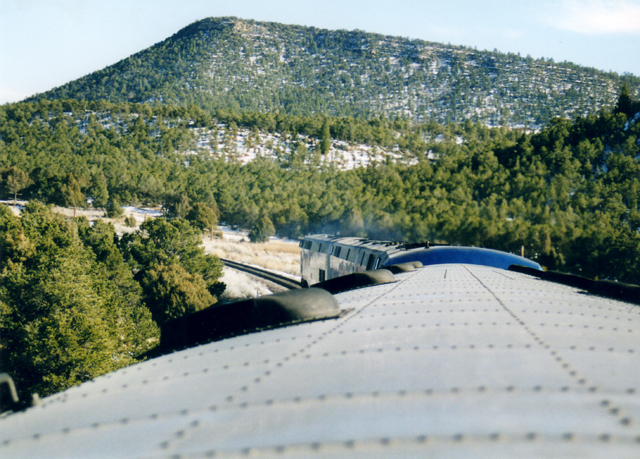 Normally the crew sleeper would be off limits to Amtrak guests, however, this opportunity was granted to allow this writer to chronicle this historic rail line. Six minutes past Lamy, the Southwest Chief passed through Apache Canyon whose narrow granite walls tightly envelope the railway. 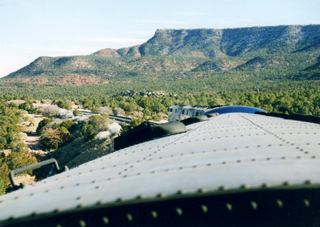 After passing through Canoncito, the Chief tackled impressive Glorieta Pass at 2:25pm then met the westbound Southwest Chief at Fox siding at 2:36. Another interesting sight, Starvation Peak, came into view at 2:53pm, however, we would not make our closest pass of the distinctively shaped mountain for another 27 minutes. Before then, we crossed the Pecos River at Rybera and circumnavigated a famous double "S" curve 10 minutes later at 3:15pm. 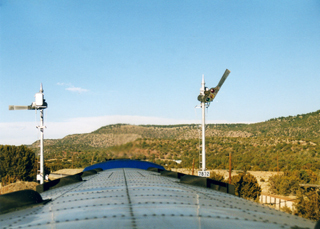 Between the double "S" curve and our next stop, Las Vegas, NM, we passed 22 classic semaphore signals, half of which guarded eastbound movements. The sight of the blades lowering after our lead engines passed was a special memory to file in our memory banks. 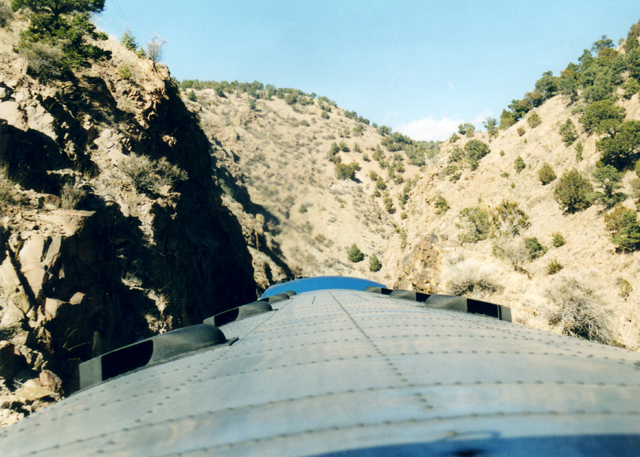 A rare forward view looking over the baggage car and engines as train # 4 travels east of Lamy, NM, passing through Apachee Canyon. 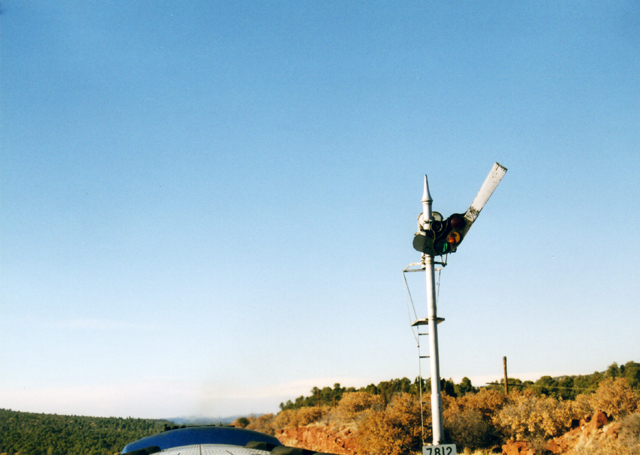 Seventeen minutes beyond Las Vegas, the Chief traversed scenic Shoemaker Canyon where a few more semaphores still protect train moves. 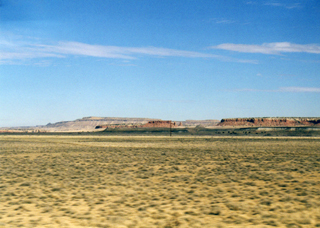 A half hour later Wagon Mound Mountain, shaped like a prairie wagon from pioneer days, appeared dead ahead. The beauty of this region typifies the settings of many movie westerns and, at the same time, provides appreciation for those who traveled the old Santa Fe trail. 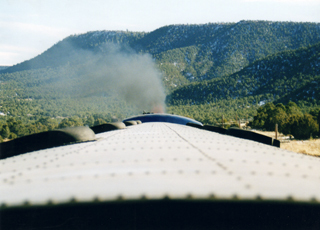 We returned to our forward perch an hour later as we departed Raton, NM at 5:36pm and began our final approach to Raton Pass, the highest point on our line. The quartet of P42 engines were working hard though the westbound trek over the pass is more taxing due to a steeper grade. Fifteen minutes later, a herd of 30 or 40 elk bounded down a hill and safely crossed just ahead of our train moments before we ducked into 1/2 mile long Raton Tunnel. Only the engineers could have witnessed this sight like we did. 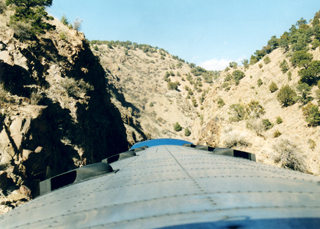 When we exited the tunnel we were in Colorado and beginning the steep downhill journey, passing legendary Wooten Ranch on the left. By this time darkness had set in as building snow clouds obscured the setting sun. If rumors are to be believed, the sun may be setting on the Raton Pass line as most BNSF freight traffic uses a lower grade route through Amarillo, TX and talk of a sale to a short line or outright abandonment has resumed as it has been the case periodically in recent years. Dinnertime came at 6:30pm as we arrived in Trinidad, CO and once again the soft music, carnations, and superb cuisine made for a memorable experience. Pleasant company was enjoyed during the meal and once more our tablemates were making their first trip by train. As John slept, we crossed into Kansas, his 49th state, which tied him with good 'ole dad (in late 2005 we visited Hawaii, our 50th state visited). Passenger trains are the reason for our being able to reach so many states as only South Dakota has not involved any train riding. One can only hope future generations will be able to see our great nation as well as we have. The morning of Friday Feb.15th found us backing into a siding at DeSoto, KS to uncouple several of our roadrailers which would then be driven to their destinations. This isolated location apparently allows train # 4 to switch out these cars without interrupting the busy BNSF line. During the middle of the night we had passed through Topeka and Lawrence on one of the few Amtrak segments I had not covered prior to this trip. 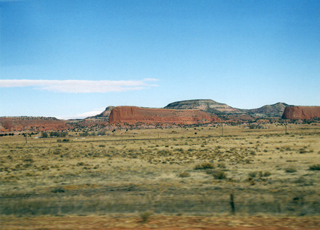 On my 1976 westbound journey on the Southwest Limited, Amtak bypassed those cities. After an hour spent cutting the roadrailers, we were underway toward our next station stop, Kansas City, MO. Departure from K.C. came at 8:48am, a mere 27 minutes late and shortly we climbed over a new flyover that has helped alleviate rail congestion at a busy rail junction. 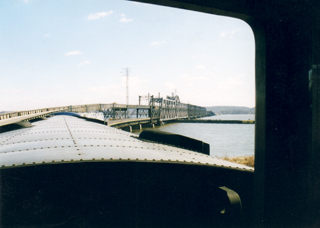 A half hour later we crossed the Missouri River on an impressive low steel trestle and travelled though rural country to LaPlata, MO. The Chief nicks the southeastern edge of Iowa, and we made our sole Hawkeye State stop in Fort Madison at 12:28pm. The Mississippi River flowed past on our right side and was crossed just east of the station on a curved combination highway/rail bridge. Forty minutes later we reached Cameron Jct., where a new connector track was built through a cornfield a few years ago to link the former Santa Fe and Burlington lines following the BNSF merger. 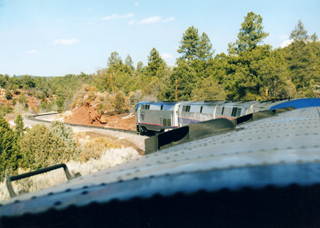 This connector is viewed better from the Southwest Chief than the California Zephyr as the old ATSF passes above the ex-CB&Q then the new connector track makes a sweeping arc back to the former Burlington line. The CZ cruises at speed below the ex-ATSF while the Chief navigates around the connector after passing above the CB&Q. 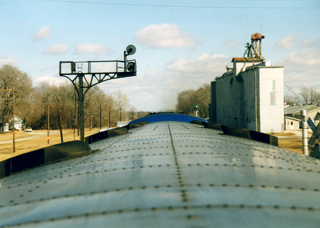 Prior to the connector's opening, the Southwest Chief operated via Streator and Joliet rather than Mendota and Naperville. A few minutes past Cameron Jct. we eased to a stop in Galesburg, IL which has the distinction of being served by three different Amtrak trains bound for three different destinations on their westbound journeys. By 3:13pm we were passing through Aurora and gliding along the busy freight and commuter line through Naperville and Downers Grove. Shortly, Sears Tower and the Chicago skyline came into view and train # 4 paused to drop its express cars near the Amtrak yard before backing into Union Station. Our 4:21pm arrival was actually 15 minutes ahead of schedule and we sadly bade farewell to a train that lived up to the old Super Chief name. 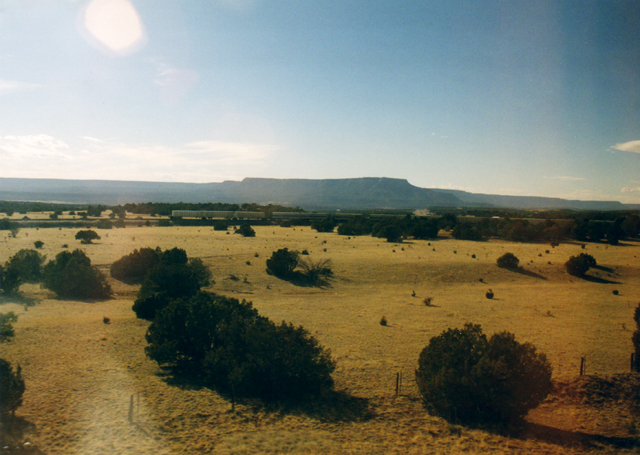 The entire experience of riding the Southwest Chief, from scenery to ambiance, to cuisine, and crew friendliness, definitely rated a "top ten" ranking on my list of best train rides. Our timely arrival gave us a five hour layover so we checked in the Metropolitan Lounge, stowed luggage in the check room, and decided to cover the Orland Park METRA line that we had yet to ride. Train # 15 was crowded for its 5:30pm departure but we found seats near the middle of the long train. Part of this line is now used by the Cardinal which makes a circuitous entry into the Windy City, however, we were unable to spot the point where its route diverges as darkness set in soon after we left Union Station. As a result, our 75 minute ride served primarily to add another rail line to our mileage map rather than a sightseeing junket. Due to limited service on this line, roundtrips are only possible on early weekday mornings and weekday evenings. We were able to stay on board at Orland Park as there was a mere 10 minute layover and at 7:51pm we were back at Union Station and ready for a fast food dinner. Next up was a ride on Amtrak's Three Rivers, the successor to the famed Broadway Limited. Our 15 minute late departure at 9:35pm was followed by a 73 minute stop at the Amtrak yards to attach 1 express car and 15 roadrailers. The delay gave me a chance to visit the Horizon cafe next door and select a bedtime snack to supplement the McBurger from earlier. Meals, snacks, and beverages are complimentary for sleeper passengers in an operation that is very similar to the Twilight Shoreliner which we reported on last fall. Prior to the trip, this food service promised to be a letdown from the full meals enjoyed on other long distance trains, however, the change of pace proved quite satisfactory thanks in part to a most pleasant cafe attendant. While the train was standing still we had our attentive car attendant Dara Lee make up the beds. After 7 nights in standard bedrooms, Deluxe Bedroom "A" seemed like a palace. 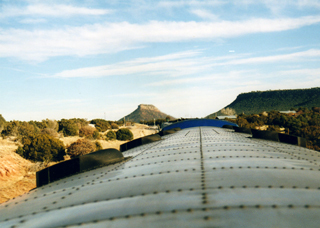 I also was happy to add a new Viewliner car, Tranquil View, to my list of sleeper rides. I decided to try out the shower in our room's bathroom and was surprised by how well it drained; in fact, by morning the bathroom was quite dry. This night's sleep was not as sound as prior nights as our room was directly over the wheels which produced a few sleep shattering jolts. It also is a bit disorienting to sleep at a right angle to the window after nights of sleeping parallel to it. Nevertheless we were ready to face the day as train # 40 pulled out of Pittsburgh at 8:54am. The former Pennsylvania Railroad mainline passes through terrific mountain scenery as it works its way along the Juniata River. The eastbound run is best as it is all in daylight. Naturally, the day's big highlight would be Horseshoe Curve and we were primed for viewing until a paralleling eastbound Norfolk Southern coal train came into view on the inside track, obscuring the vista. Several Amish families detrained in Lancaster and soon we passed numerous Amish farms, recognizable by the lack of electric wires running into the homes and by the clothes hung out to dry in the back yards. In the heart of this region we zipped by Leeman Place, the junction with the Strasburg Railroad's tourist line. As we approached Philadelphia, passing commuter stations became more frequent though traffic was light due to it being a Saturday. Philadelphia 30th Street Station was reached at 4:06pm, 36 minutes ahead of schedule. The attractive Club Acela made a fine place to cool our heels until our trip's final train arrived. The Winter Olympics were airing on the club's television and for a moment we thought "If only we could be in Salt Lake." 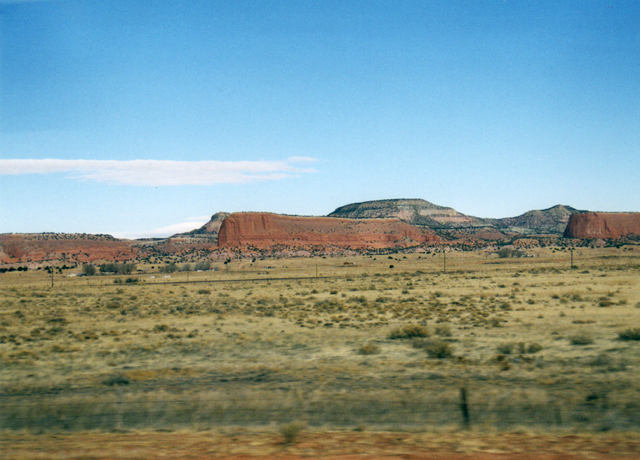 These thoughts were dashed by the realization that we would have missed Oklahoma and the Southwest Chief. The southbound Silver Meteor breezed into 30th Street Station behind a sleek new HHP engine, boarded a few passengers, and departed on-time at 8:37pm. Sleeper Tower View was another car I had not slept in yet as were the other two sleepers in our consist. Normally, the Meteor carries two sleepers, however, the President's Day weekend seemed to have attracted heavy southbound traffic. As we settled into Room 2, the first call for dinner was made so we made our way next door to the diner for a late repast. Almost instantly, the dining car filled to capacity and numerous passengers were upset at having to wait until 9:30 or 10pm to eat. Late starts for dinner out of New York seem to be the norm on train # 97 and one wonders why this crew requires 90 minutes to get started while the Southwest Chief dining car can open 20 minutes out of Los Angeles. No matter whether there was good reason, many guests were steamed. Fortunately, we had beaten the rush. As we left Washington, crossed the Potomac, and viewed the Alexandria Embassy Suites Hotel where we spent several nights last June, it was time for the trip's final night's sleep on the train. I used duct tape to block tiny beams of light that slipped through the bottom of the room door's window shade and found the result most effective. Earlier in the trip, duct tape took the place of missing velcro in holding shut a Superliner window curtain, and later helped thwart a rattling bedroom door on another train. For the only time in the trip, I climbed into the upper berth while young John slept in the lower. I found the ride smoother and the bed wider up top and slumbered soundly for 8 hours, waking only at Florence, SC. Morning found us very close to schedule and we enjoyed a final railroad breakfast while gazing at small South Carolina towns and Georgia marshes. We arrived back in Jacksonville at 12:21pm, ending our trip only 13 minutes late. Over 9,000 miles on the rails produced many fine memories of excellent scenery, golden sunsets, and a few unexpected adventures. With the notable exception of the Texas Eagle and Sunset Limited, our trains had arrived at our destinations either early or within about 20 minutes of schedule. We had missed a chance to ride the new Pacific Surfliner equipment but had covered every other intended route plus three commuter lines, and we both visited our 49th state. Meals had been among the most delicious in all our years of train travel and all equipment had been in good mechanical condition except for the cold shower on the Texas Eagle. 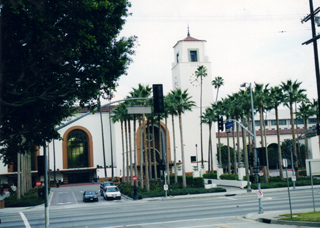 However, two of our fondest memories and certainly the biggest surprises were meeting so many nice fellow passengers who were making their first rail trip and being served by so many cheerful Amtrak employees. If the opportunity presented itself, we'd commence the same trip again tomorrow.